For native English speakers, one of the easiest ways to find work in Italy is to teach the language. And one of the best ways to make sure your teaching resume gets noticed is to be TEFL (teaching English as a foreign language) certified. Earn a TEFL Certificate in Three Days at their Weekend Course in Florence! • Pay an affordable price for great training – only 195 euros! In just one weekend, learn how to prepare lessons, create interactive and engaging activities, manage your classroom, and develop tasks based on your student proficiency levels. You’ll also learn more about the teaching of English grammar tenses and gain an understanding of what life in the classroom is really like for language learners. 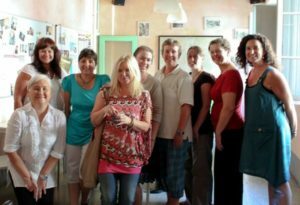 Contact “Teaching English in Italy” for Weekend TEFL course details or a 3-day course schedule. They also offer 120- to 140-hour Online TEFL Certification Courses, economic options that can be completed from anywhere in the world! Via Lingua is one of the world’s largest TEFL certification providers, and their TEFL course, continuously developed by their Academic Board, is one of the most thorough and up-to-date in the world today. Including 120 hours of expert tuition and 10 hours of teaching practice, the TEFL course exceeds international standards for TEFL certification. To guarantee the highest academic standards, the course is externally moderated by Hunter college department of EFL at City University of New York. The Learning Center of Tuscany (TLC) has been offering its language students and TEFL trainees top-notch services since 2006. TLC, in conjunction with TEFL International, opened its doors three years ago to offer an extremely high-quality TESOL/TEFL certification program and has quickly grown to become a well-respected language and culture center. TLC offers more than one choice of TEFL program in order to accommodate a diverse student population.